Welcome to Collecting Retro Games, a series of articles informing people about the ins and outs of collecting retro and vintage video games. Whether you are a beginning collector, an experienced game hoarder looking for new information, or an outsider trying to understand more about the hobby, these articles are set to inform and entertain. The 200 series is meant to look at slightly more advanced collecting subjects for collectors who already have an established collection, and are intending to expand into new territory. Collecting isn’t so much a hobby as it is a compulsion. You never actually are really satisfied. You can get every item in your list, complete a collection by finding everything ever manufactured, but you always wonder, what’s next? Well, as a game collector, particularly one that specializes in vintage video games, the big thing, the holy grail of collecting isn’t just a beautifully filled room with functioning systems displayed for all to see, it’s a beautifully filled room with functioning consoles and a couple of arcade cabinets. Arcade cabinets are the grand daddy of our modern consoles. Before kids were fueling themselves with jugs of purple drink in front of the NES, kids were popping quarters at the grocery store and arcade. Arcade cabinets invoke a sense of nostalgia for the folks who remembered when they were common, a sense of history to the preservation folks, and a sense of whimsy to the kids who’ve heard about arcades but missed the boat for the US’s arcade golden age. As such there is actually a lot of demand for working cabinets, and as a result arcade cabinets come at a premium. A rare PS1 or SNES game might run you a few hundred, but even a basic, bare bones cabinet will easily run you a few thousand. Arcade cabinets also have a whole host of different requirements for set up, maintenance and additional costs over the life of a machine. Much like having a vintage muscle car or sailing, owning an arcade cabinet will be as much of a hobby as buying them. Like any collectible, there is a good chance of stumbling across a used arcade cabinet at a garage sale, a thrift store or on Craiglist, but with arcade machines your three best bets for find a machine in decent shape will be by stumbling across an arcade going out of business, a forum for other collectors, or direct from a dealer. And like anything else there will be pros and cons to each. Arcades are sort of in a transition state right now. There are some that are still thriving and starting to build up, but many more are closing their doors forever. Arcades that used to be in malls, shopping centers and shared space with laundry mats and movie theaters tend to close down the most, and when they do, they always offer their machines to the public. The nice thing about going directly to these dying arcades is you can see exactly what you’re getting. You can look over the machines yourself, see if they are in working condition, exactly how much wear and tear they’ve endured and what kind of maintenance you’re looking at. You can also see if you can talk with the owners directly and strike up a deal. The downside is that most of the machines that are available will be newer games and machines, ones made in the past 10-15 years instead of ones made in the past 45. Also, there is a pretty high likelihood that the machines will be in pretty mediocre shape since you’re looking at workhorses instead of a hobby machine. If you’re less concerned about having a top of the line, perfect looking machine in your house, and simply want a working cabinet, then getting one from a failing arcade is probably as far as you need to go. If your interest in arcade cabinets is more than cursory and you’re really serious about maintaining what’s effectively your own private arcade, then what you need to do is start getting into the collectors’ circles. Finding forums, clubs and groups of arcade collectors will not only open up your opportunities of starting a cabinet collection, you will also gain insight from experienced collectors who will be more than happy to give you more information. In the interest of full disclosure, I am not an arcade cabinet expert, nor do I pretend to be, and for most of the information for this article, I actually scoured the forums at Arcade-Museum.com. When dealing with people whose passion is arcade machines you might not always get crazy fantastic deals, but the people within those forums will teach you what to look for, and might offer a little slack for a newbie. Because arcade cabinets have become such a hot commodity, there are actually lots of institutions that act exclusively as dealers in arcade machines. These dealers have showrooms and store hours, as well as websites for you to hunt down that cabinet you’ve always wanted. You won’t be finding any deals here, most likely, but you’re more likely to get more guarantees and recourse for your purchase than if you buy from some random stranger on Craigslist. It’s important to ask lots and lots of questions, because much like a used car, a cheap but messed up cabinet may end up running you more problems and more money than a more expensive but better condition machine. An arcade cabinet, at its barest bones, is made of two major components: the cabinet itself and the board. The board is the game itself and is a series of circuits and microchips that when connected to power can access the game and store the game’s results. The cabinet is the box the board is stored in, the buttons, graphics, monitor and other components that make the game playable and is aesthetically pleasing. Simply put, the most valuable, desirable machine is an original cabinet, with original graphics with its original board all in working condition. More likely though, you will be finding something akin to a Venn Diagram of parts, pieces and decals in various states of working condition or originality. While a lot of times people look for the original games and cabinets, it is also very common for collectors just to sell the game’s circuit board so that other collectors can make their own cabinet or hire someone else to do it for them. While boards can be repaired to a degree, if they are completely fried or damaged, they aren’t good anymore and you will need to seek an entirely new board for your machine to work. Board price vary on the rarity of the game as well as condition, and if building and customizing your own machine is something that interests you, this is an issue you can research further. Just remember to ask lots of questions of the seller before making an investment, talk to other, more experienced collectors for advice, and see the reputation of the person you plan to buy from. While you can’t 100% protect yourself from bad deals or scams, being as informed and as cautious as possible will save you in the end. Cabinets are a lot easier to deal with because they are far easier to inspect and repair, and the biggest issue you need to worry about when searching for a machine to buy is making sure that information you are getting about the cabinet is accurate. Restoration is very common. Everything from the wood/particle board of the machine to new graphics printed out and slapped on top of the old paint job can be changed and altered. While there is absolutely nothing wrong with making an old, beat up pile of junk look it just came from the factory, it is highly unethical and in many cases, fraudulent, to claim a machine as mint if it’s been restored. Why does it matter? Because people pay for quality. A game in mint shape means it was taken care of since its original purchase, but a restored one could be covering old problems. There’s a whole world of restoration, reproduction and originals, and what exactly something is can effect the value immensely. Similarly, restoration can sometimes hurt value of various antiques and collectibles, especially if badly done. So if you do plan on restoring an old machine, talk to an expert about the best course of action so you don’t accidentally devalue your investment. As I’ve repeated several times before, arcade cabinets are a completely different animal than console gaming. While TV console and cartridges have their own issues in terms of protecting and keeping your collection, arcade machines have additional upkeep and issues you need to be aware of. You might think you’re just getting something cool for your rec room or garage, and end up cursing the day you brought your machine home. For example, do you plan on having your cabinets playable all the time? While the good news is you won’t have to rewire your house because cabinets use a standard grounded plug for 110V system, they use a LOT of electricity. Also, when a machine is hooked up and used frequently, the monitors tend to burn out. You will need to make sure that your machine never overheats, is exposed to dramatic temperature fluxes or power surges. Part of the reason that so many arcades went of business was because the cost of maintaining and upkeeping the machines in working order far outweighed whatever profits $.25-1 per play would bring in. Even without a plague of tween kids pounding on the machines all afternoon, they can still breakdown and burnout. More modern machines can have even more issues as the more sophisticated games have more parts and components that can break down and need to be monitored. Games that originally were connected to servers to calculate universal scores might be technically fine but start having software issues. Long story short, even if you invested in a machine in amazing shape with few problems, just the nature of owning and playing the cabinet will result in additional costs in electricity, repair and parts even if you choose to tackle repairs yourself. There’s a reason why I keep using a used car analogy, you guys. While vintage machines are neat and all, a lot of people are much more excited by the idea of a custom cabinet, either a machine with a game that hadn’t originally appeared in an arcade, or combining several of their favorite games into one machine so they can play any of them as they choose. There are two ways to go about this, both of which are heavily covered by Youtube and similar sites. One way is to fake it, which means you more or less have a cabinet shell that you attach a TV, a console and controller so that it looks like you have arcade cabinet. The other is to go really oldschool and produce a cabinet yourself. Many modern companies will be happy to design the cabinet for you with your specifications, but if you are truly ambitious (and more than just a little bit masochistic) you can build your own cabinet in your garage and put together your own machine with all the components needed to produce a fully functioning arcade model. For many vintage game collectors, owning an arcade machine is the holy grail of their collection, a piece of authentic gaming history that predates anything with a disk or cartridge. But while it might be handsome to own your own Ms. Pac-man or Dance Dance Revolution machine and have it in a place of honor, collecting arcade cabinets is a separate sub hobby that takes up a lot of time, money and energy. Finding and obtaining machines are a huge investment, and a game in working shape will require additional costs in electricity and maintenance. You will either need to learn how to deal with repairs yourself and invest in a good set of tools and parts, or you will need to have a company or service on standby to deal with all your issues. But if none of this seems daunting, then by all means, home arcades are a novel and rewarding hobby where you even create your own custom machines. Special Thanks to Salvador for getting me in touch with the forum and forum itself where I did all my lurking and research. TheGeekEmpress is the artist and writer for the webcomics The Sorcerer’s Apprentice and Midnight Menagerie and a massive gamer. During most of high school and part of college she worked at her mother’s online collectibles business looking for items, researching value and restoring damaged goods. 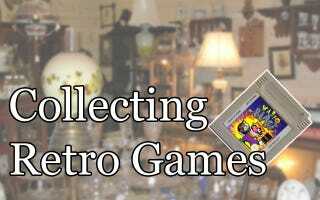 On TAY she writes the Collecting Retro Games series and runs the monthly feature Craf-TAY Corner. You can read her articles Talk Amongst Yourselves and see more of her work at her site, Bwillett Comics.